This month, we hosted 17,000 attendees at Microsoft Inspire, our annual partner conference, and announced a set of new capabilities in Microsoft 365 that enhance teamwork—including a free version of Microsoft Teams. 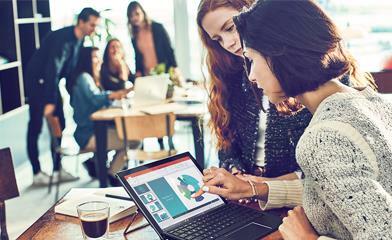 We also rolled out a number of new features across Microsoft 365 to help organizations empower their employees—including updates that streamline the management of common tasks and improve data visualization. We also want to hear your feedback, so that we can make sure these updates are relevant and useful to you. Here’s a look at what’s new in July. 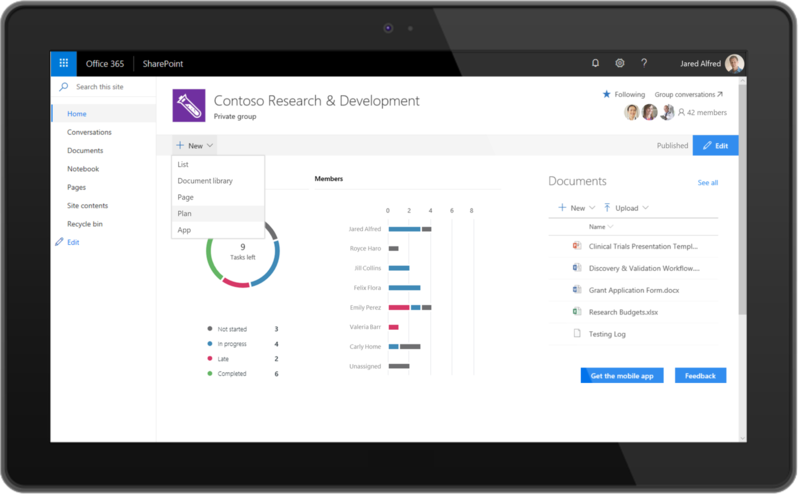 Microsoft Planner capabilities in SharePoint team sites—We integrated Planner with SharePoint to bring new task management capabilities directly into team sites. You can now add a plan directly to your team site from within SharePoint and embed Planner boards and chart views from those plans within SharePoint pages and news posts. This integration enables team members to easily access and interact with project tasks, while keeping important resources in a single repository. Add plan information directly on pages and news posts with the new Planner web part. Threaded comments in Microsoft Excel—We introduced threaded comments to Excel, improving collaboration on shared documents and providing a consistent experience across Word, Excel, and PowerPoint. Threaded comments enable you to easily follow conversations taking place around content in a document and directly interact with coworkers using @mentions and nested replies. These improvements make it easier to work on spreadsheets with multiple collaborators and enhance readability and editing across devices. Threaded comments in Excel is available in preview to Office 365 subscribers enrolled in the Office Insiders program this month, and will be available to all Office 365 subscribers later this year. Threaded comments make it easier to work with multiple team members in Excel. Visio Visual for Microsoft Power BI—Power BI subscribers can now use powerful Visio visualization capabilities, right in Power BI. With Visio Visual, you can create interactive Power BI dashboards using Power BI data sets and Visio visualization tools to quickly illustrate and compare data with charts and diagrams. Visio Visual provides new and exciting ways to explore data in Power BI. Microsoft 365 usage analytics in Power BI—We announced the general availability of Microsoft 365 usage analytics in Power BI. Now, Microsoft 365 usage data can be connected directly to Power BI to help you better understand the services you own. We also introduced a new Teams usage report, which provides an overview of how your organization works together in Microsoft Teams, with details on various functions like chat, channels, and meetings. By using Microsoft 365 usage analytics, admins can drive improved adoption of services throughout their business and better leverage IT spend. LinkedIn Sales Navigator in the Microsoft 365 people card—We’re enhancing the Microsoft 365 people card to include information from LinkedIn Sales Navigator. This update allows you to surface profile information for your prospects and customers everywhere their people card appears in Office 365—helping you to build better relationships. LinkedIn Sales Navigator in the Microsoft 365 people card allows you to build better relationships. 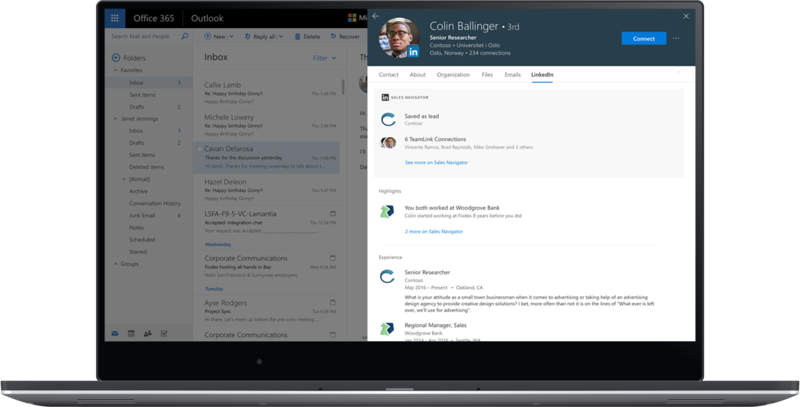 LinkedIn Sales Navigator in the Microsoft 365 people card is rolling out soon to Microsoft 365 and Office 365 commercial customers in Outlook for the web. Workplace Analytics solutions and MyAnalytics nudges allow teams to master their time and work smarter with data-driven collaboration tips. Microsoft Whiteboard for Windows became generally available July 12, 2018. Proposal Manager for financial services is a new solution that helps lending teams increase proposal win rates—now available to all Microsoft 365 E5 customers. Centralized Deployment for Outlook add-ins is now generally available to Office 365 commercial customers. Search and Tag in Advanced eDiscovery is now rolling out to help you find the most relevant and responsive data within a case and tag that content for further review. We announced new capabilities that allow anyone in your organization to create live and on-demand events in Microsoft 365.